The upper Kitsumkalum River, located north of the city of Terrace, is an excellent day trip or short overnight trip for canoeing or kayaking. Boaters can start at the confluence of the Upper Kitsumkalum River and the Cedar River, north west of the town of Rosswood. The paddle down the Class 1 stretch of river, which offers excellent scenery and wildlife viewing opportunities, brings you to the north end of Kitsumkalum Lake. A short paddle along the north shore of the lake completes the trip. Paddlers should be aware of any sweepers or dead heads that may be difficult to spot. Be aware of any common river hazards such as changing water levels, changing currents, sweepers and dead heads. It is advised to use caution while paddling the river. Bring your own drinking water as potable water is not available in the protected area. Please note: A section of the Protected Area is leased to BC Parks from The Nature Trust of BC, a non-profit land conservation organization. The Nature Trust Lands within North Kitsumkalum Protected Area provide refuge for waterfowl, fish, and wildlife – and this part of the protected area is closed to hunting. 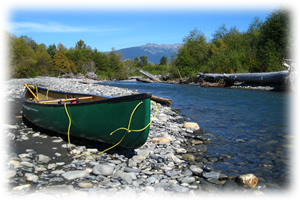 Paddlers can put in at the confluence of the Kitsumkalum River and the Cedar River, north west of the town of Rosswood. To get there; drive north on the Nisga’a highway from Hwy 16 in Terrace, then west on Old Rosswood Road just past Rosswood to the river. Take out can be done at the north east end of the lake where there is an access point along the highway. The closest communities are Terrace 35 km and Rosswood 3 km. Wildlife: While paddling the Kitsumkalum River, it is common to view black and grizzly bears, moose, eagles and a variety of other birds. There is no electronic version for the protected area available. The boating route begins at the confluence of the North Kitsumkalum River and the Cedar River north west of the town of Rosswood. The ending point of the route is along the north east shore of Kitsumkalum Lake. There are some camping opportunities on the many sand and gravel bars that line the river banks. Camping is limited to boaters. The Upper Kitsumkalum River offers good seasonal fishing opportunities for Coho salmon, Dolly Varden char and Cutthroat trout. See the Freshwater Fisheries Society of BC website for more information. Anyone fishing or angling in British Columbia must have an appropriate licence. Check water specific regulations in the current BC Freshwater Fishing Regulations Synopsis and BC Freshwater Salmon Supplement. This protected area is partially open to hunting. Please refer to the British Columbia Hunting and Trapping Regulations for more information. Backcountry areas are not suitable for dogs or other pets due to wildlife issues and the potential for problems with bears. If you pets are accompanying you, please have on a leash at all time. There is swimming in the river but there are no lifeguards on duty at provincial parks and areas. Camping can be done on the many sand and gravel bars along the shores of the Kitsumkalum River. Camping is limited on the north end of the lake. There are no facilities provided on the river.